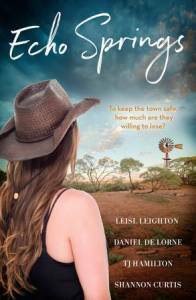 Echo Springs on the edge of the outback – a town where everyone knows your name, and your business. But the wholesome country living and welcoming community aren’t what they used to be. Echo Springs has a dark underbelly, and it is seeping ever outward. The small police station is overrun, and officers are working overtime to stem the tide of illegal activity from graffiti through to murder. From prickly Leila to heartsore Ben, Cooper with something to prove to Mac who’s driven to succeed, the Echo Springs force is determined to keep the town safe. But the stakes are higher than they’ve ever been, and it’s not just the town these officers have to keep safe. It’s their hearts as well. With bullets flying and bodies piling up, they will have to decide how much they’re willing to risk and what they’re willing to lose. Killing me Softly would never have got published without perseverence. Reclusive record producer, Alexia Deningham, guards her privacy fiercely. When she agrees to work with superstar Daemon Flagherty, and his band, it is only on the condition that they stay with her at her isolated country estate. Fresh from a messy divorce, Daemon is determined to focus on his music. He wants to work with the best and that means Lexi. He certainly isn’t looking for romance, but he finds himself intrigued by Lexi’s secretive behavior. Despite Lexi’s reservations, their attraction grows. But someone is watching Lexi. Someone who will stop at nothing to destroy the woman who has ruined his life. When his campaign of terror ratchets out of control, Lexi must fight for survival but who can she really trust? Harlequin Junkie 5 Heart review. I really enjoyed reading this book and I can’t wait to read more from this author and publisher. I will definitely be adding this book to my favorites list. This is one of my favorite reads this year. I don’t see how I’ll be able to write a review that does this book justice. One of the best stories I’ve ever read..So much suspense..It was so intense that I was reading every page as if they were holy…I was so engaged in the story that everything else just disappeared..
A remarkable work..It’s a true masterpiece..